“You say you want a revolution, Well, you know, We all want to change the world.” — The Beatles. 3D printing is revolutionizing everything from prototyping to custom manufacturing to the arts to now music. Music? Yes, Last year we showed off a 3D-printed Stradivarius violin. 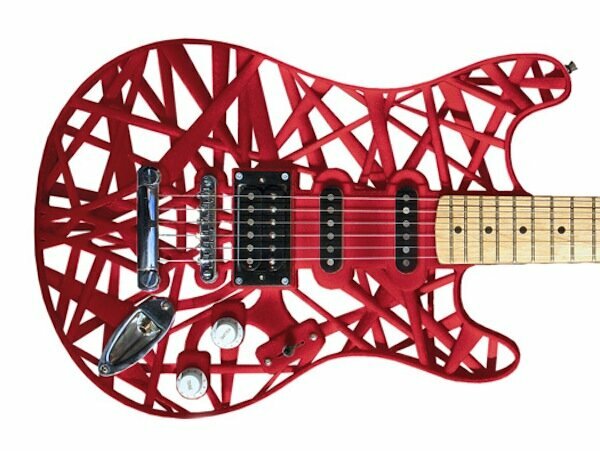 Since then there have been other musical instruments that some have 3D printed, but today we have a real beauty of a 3D printed guitar to show you. It’s the creation of Derek Manson, Director at one.61, a product development firm. The main body is made from a polycarbonate polymer and the central core is CNC machined wood which still allows for excellent tonal properties. Beautiful. Not really sure where to by the darn thing though. But if you want one you could yry contacting Manson at one.61.